You may have noticed that there has been a quite a gap between the last episode of Wilderkids and this one. The art/book side of my life has taken over everything lately - in the final push to get my next children’s book finished and in preparing for a tiger fundraising art exhibition. However, everything is now back on track and I can once again give the podcast, both the interviewees and the listeners, the attention it deserves. 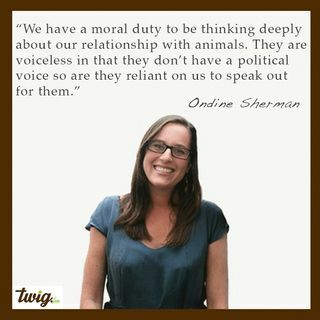 Today’s guest is Ondine Sherman, co-founder of the ... See More not-for-profit Voiceless and author of the young adult fiction book Sky. We actually did this interview back in April and the lovely Ondine has been incredibly patient with me not having had a chance to edit (which always takes a surprisingly long time) and publish our chat until now, so thank you Ondine!!! Voiceless envisions a world in which animals are treated with respect and compassion and is doing amazing work in drawing attention to the plight facing animals in factory farming and in the protection of wild animals. They believe in the power of education to ensure a better future for animals. Something I also believe in strongly. Her reasons behind creating Voiceless and the work the charity undertakes. How she managed to get the support of celebrities to boost the profile of Voiceless. Why they are now focusing their attention on youth empowerment. The shocking truth behind the kangaroo meat industry. How they tackle teaching animal cruelty to teenagers without giving them graphic details. The young adult fiction book, the first in a series, that Ondine has written. The book, Sky, is about a young vegan Australian that engages youth in animal protection issues. How Australia and Israel compare in their conservation issues and their approaches to these issues. And the surprisingly collaborative and peaceful relationship between Israel and it’s neighbours that you never hear about in the news.